The always interesting Michael Lind has a piece out in Slate saying that the left should stop using the word progressive and return to calling themselves liberals (I agree). He gives seven reasons for the switch (or rather return), a few of which really are key (my numbers don’t line up with his numbers). C) The early progressives of the 20th century who for all their good in some areas were also deeply social conservative, authoritarian in places, technocratic, and often racist. None of A,B, or C is really a good tradition going forward for a healthy left in the US. Hubert Humphrey, liberal, championed integration and federal enforcement of civil rights. Woodrow Wilson, Progressive, resegregated Washington, D.C. The Warren Court liberalized abortion and censorship laws. The early 20th century Progressives campaigned to outlaw alcohol and outlaw abortion and many of them favored eugenic sterilization of the “feeble-minded.” New Deal liberals celebrated Americans of immigrant stock. Progressives like Woodrow Wilson and Theodore Roosevelt were horrified by “hyphenated Americans.” Roosevelt and Truman inherited a disturbing progressive fondness for executive prerogative but by the 1960s and 1970s civil libertarianism and a renewed interest in checks on the imperial presidency became part of the liberal tradition. 2. Progressive is too Prussian Germanic (and therefore militarized and worried about centralization of power as well as purity issues) growing out of an original vision that was Bismarckian not Lockean (i.e. classical liberalism) in nature. Like “conservative,” “progressive” is a term associated with a particular view of history. The conservative wants to stand still or go back; the progressive wants to move forward. Progressivism implies a view of history as perpetual progress; conservatism, a view of history as decline from a better world in the past. Needless to say, nobody who actually thinks this way could function. In the real world, self-described progressives aren’t mindlessly in favor of everything new, just as self-described conservatives aren’t indiscriminately in favor of everything that’s old. Unlike progressivism and conservatism, liberalism is not a name that implies a view that things are either getting better or getting worse. Liberalism is a theory of a social order based on individual civil liberties, private property, popular sovereignty and democratic republican government. Liberals believe that liberal society is the best kind, but they are not committed to believing in universal progress toward liberalism, much less universal progress in general. Many liberals have been skeptical about the idea of unlimited progress and have believed that a liberal society is difficult to establish and easily changed into a nonliberal society. The upshot of which as Lind correctly points out is that liberals can be or have progressive ideas (contextually) as well as conservative ones. Lind is making the argument (contra Jonah Goldberg) that the mid-century New Deal Liberals were just that liberals (not progressives primarily–though of course they did have some progressive goals, aims, and policies). It would hopefully also allow liberals to not continue to act like they have to out hawk the neocons in order to look tough on foreign policy. Update I: For those interested, in integral politics according to Ken Wilber’s scheme this is the breakdown of the three meanings of liberal. III. Liberal as External (right-hand Quadrants) oriented. i.e. New Deal Social Liberals. Thanks to all who were able to attend the presentation I led last night on integral politics. We had a good discussion and hopefully will lead our local salon to think of some ways to participate in the polis here locally. The sound recording didn’t turn out as well as I had hoped, I might play with it and see if I can post pieces. Though no promises on that front. The next few days are pretty busy, but I’m hoping perhaps to do a series of posts digesting and working through some of the main issues I worked on last night. What comes through more and more for me is the necessity for the recreation of civil society. More so than party building although that is a piece of the issue. Habermas and Taylor’s recent work on civic (and civil) reason I think is crucially important in this regard (I’m more Taylorian than Habermasian in some respects). I’m leading a presentation on integral politics Monday night here in Vancouver, for any readers of the blog in the area. I hope to record the audio and post my Power Point slides sometime next week, depending on the quality of the recording. Politics according to Aristotle is the art of the polis. Polis-things in other words. The art of the possible, the art of compromise within the life of the polis (the city-state). We will explore in depth the current transformation of humanity brought about by the mass migration of human beings from rural to urban life, the rise of technology, and politics in the global polis. Integral thought provides a lens whereby to make increasing sense of and bring clarity to the complexity of our world. We will explore the intersection of integral thought in the political events of our day. Come prepared with questions on any topics you would like discussed–there will be a good amount of time for questions—for example the Canadian elections, US elections, War in Afghanistan, Economic Crisis, Terrorism, and/or more local concerns. 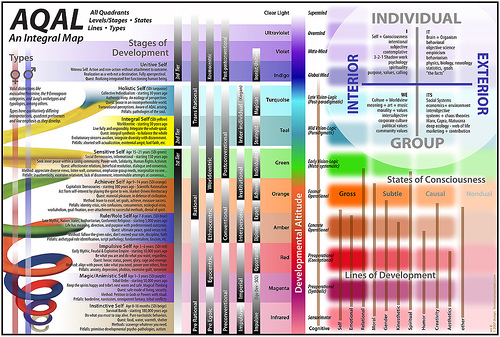 If people are interested, Integral Life has put out a short but helpful video introduction to politics through Ken Wilber’s AQAL system on their website. I recommend it, but it is not required–fear not there will be no quiz!!!! [Image Courtesy Steve Self via Flickr, CC License].